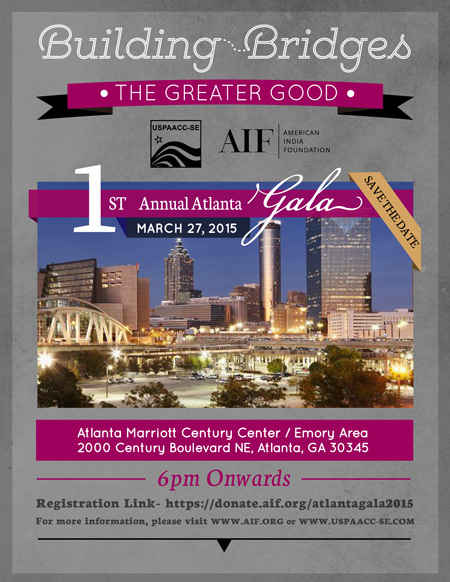 AIF & USPAACC-SE Building Bridges Gala. About USPAACC: WE ARE THE OLDEST AND LARGEST ORGANIZATION REPRESENTING ASIAN AMERICAN AND ASIAN AMERICAN-RELATED GROUPS IN BUSINESS, SCIENCES, THE ARTS, SPORTS, EDUCATION, PUBLIC AND COMMUNITY SERVICES. As a thought leader with 29-year of track record in business matchmaking accomplishments, strong partnerships with corporations, government, and Asian American businesses, USPAACC is poised to raise the bar to yet another level. About AIF: American India Foundation, AIF (www.aif.org) is a unique philanthropy committed to catalyzing social and economic change in India and building a lasting bridge between the United States and India through high-impact interventions in education, livelihoods, public health, and leadership development, with a particular emphasis on empowering girls and women to achieve gender equity. AIF implements innovative solutions to create and scale sustainable impact. Founded in 2001 at the initiative of President Bill Clinton following a request from Prime Minister Vajpayee, AIF has impacted the lives of 2.3 million of India’s poor and aims to reach 5 million by 2018. Venue: Atlanta Marriott Century Center, 2000 Century Boulevard Northeast, Atlanta, GA 30345. Reward staff and/or entertain your clients. American India Foundation, AIF (www.aif.org) is a unique philanthropy committed to catalyzing social and economic change in India and building a lasting bridge between the United States and India through high-impact interventions in education, livelihoods, public health, and leadership development, with a particular emphasis on empowering girls and women to achieve gender equity. AIF implements innovative solutions to create and scale sustainable impact. Founded in 2001 at the initiative of President Bill Clinton following a request from Prime Minister Vajpayee, AIF has impacted the lives of 2.3 million of India’s poor and aims to reach 5 million by 2018. USPAACC (www.uspaacc.com) is the largest national, nonprofit, non partisan organization representing Asian Americans and related groups in business, sciences, the arts, sports, education, public and community services. 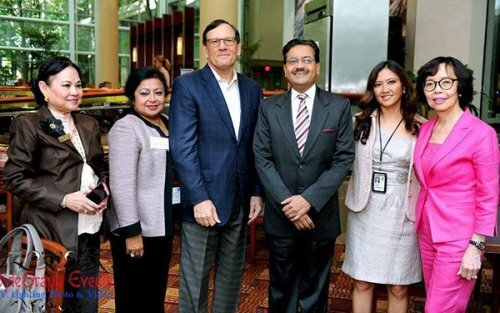 It has been a thought leader with 28-year track record in business matchmaking accomplishments underlying strong partnerships with corporations, government, and Asian Americans.